There is no denying that Saturday night’s game in Gibraltar was pretty dire, but this isn’t the moment to point accusing fingers at Mick McCarthy and his players. Playing on a terrible pitch in front of a small crowd, dealing with a howling wind and with planes landing a few yards away, this was not a night for looking good – more an occasion to just get the job done. It was hard to pick out too many stand-out performances against a Gibraltar side that kept their shape well and closed down the Ireland players at every opportunity and if we are being honest, everyone was pleased to hear the final whistle. Mick tried a few new things and I’m not sure they worked, with Matt Doherty struggling to get into the game in his midfield role and James McClean struggling to make an impact. David McGoldrick also lacked the kind of service he needs to get his Ireland career moving forward, but this was a new-look team finding its feet and it will take the manager and his staff time to get them singing to his tune. I’m sure Mick didn’t tell his players to hit long balls in the directions of Sean Maguire, but that is what we were doing for far too long in the first half and it didn’t get too much better after the break. Darren Randolph needed to be at his best to deny Gibraltar with their one big chance in the second half and the one moment of class in the game finished with the goal that won the game for Ireland. Jeff Hendrick finished his chance so well and it was enough to secure Mick’s first win in his second spell as Ireland manager and even if there will be criticism after a pretty poor performance, I prefer to paint an upbeat picture at this stage of the qualifying campaign. It was almost like a practice game last night and while it was hard watching it, let’s hold fire before we start criticising. The Euro 2020 finals have games in Dublin and we have to get the Ireland team there for those occasions, as they could be some of the best moments in the history of our national team. Saturday night was all about starting the process of getting to those finals and three points was a must if we are to have any chance of qualifying. The Ireland display in Gibraltar was not much better than what we saw from the previous management team last year, but I remain convinced better days lie ahead for us under Mick and his management team. It was heartbreaking to see some of the dreadful performances in the final few months of Martin O’Neill’s reign, with the mood of negativity around the squad affection the morale of the players and our wonderful fans. What Mick will do is lift that gloom and it has been nice to see the players coming out in the media and suggesting they are enjoying being around the squad again. We have to give O’Neill and his assistant Roy Keane credit for picking up some fantastic results with Ireland, but it was clear the players were not happy by the time they left their posts. It didn’t help that Martin would often come out in public and suggest the players were not good enough to compete at the highest level, with that kind of comment not helping a squad that was already sadly lacking in confidence. We all appreciate that this is not the most talented group of Ireland players, but they give their all for the badge and your job as a manager has to be to get the best out of the tools at your disposal. I’m not convinced Martin and Roy were doing that in their final few months in charge and we will now get a chance to see whether a fresh face and a new set of ideas can fire an Ireland team that was badly in need of a reboot. From my experience of being around Mick, he lifts the mood of everyone in a room. So even if it takes him some time to get this team playing some good football, we should be optimistic heading into the crucial qualifier against Georgia on Tuesday in Dublin. Mick has a wonderfully dry sense of humour and he picks his moment to drop a funny line in when the mood needs it. I remember him chipping into Jack Charlton’s team-talks at times and he was a fantastic guy to be around, so it is no surprise to see he has a way of inspiring players now that he is a manager. Changing the mood around the team was a priority and even if the performance in Gibraltar didn’t reflect that shift, I feel we will see a more upbeat Ireland team under this management. The draw has been relatively kind to Mick, with the Gibraltar game offering him a chance to get off to a winning start and now he has to find the right balance in his team against opponents who will offer a lot more. It will be interesting to see what Mick now does heading into the Georgia game. 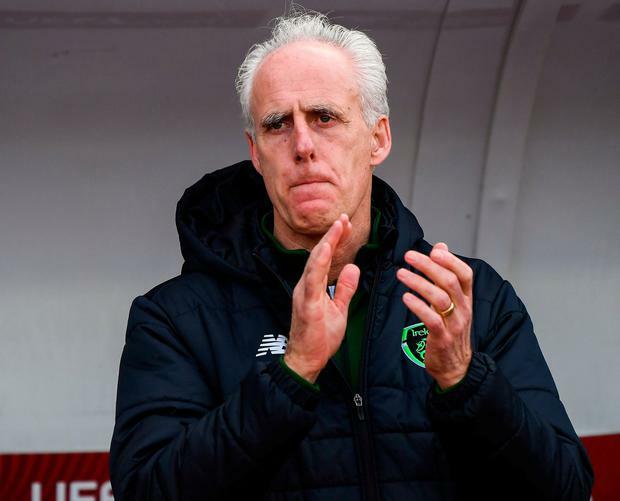 He may be tempted to play with just one player up front in Dublin and we need to get more width, with Robbie Brady another option to put into the side if Mick feels he needs to inject a little more creativity. Georgia were dangerous when we played in Tbilisi in 2017 and will be a threat at the Aviva Stadium, but I expect the mood to be revived among Ireland fans eager to start smiling again when they attend matches. We want to hear that stadium buzzing again because the Irish fans can be so important to the Irish team when they are fully behind the lads and I’m sure these players will respond if they get that backing. They may not be playing for the top sides in the Premier League, but the pride of pulling on that green shirt drives any player on and we have to hope that we see a much-improved performance against Georgia.